Congratulations to our new Miss PR NPRDP ! The National Puerto Rican Day Parade , Inc. wishes to salute and extend a heart-warming welcome to her Majesty Francis Marie Cruz, as the new Miss PR NPRDP . The Board of Directors of the National Puerto Rican Day Parade, Inc. recognizes that within her year, Miss Francis M. Cruz will represent with pride our culture, Puerto Rican heritage, empowerment, tenacity, as well as our love and sense of protection to the natural beauty of our Island, values that are instilled in our young generation of Puerto Rican woman. This is a competition of cultural pride, with goals of self-confidence, self-esteem and education; which will provide the contestants with an opportunity to learn about their roots and develop pride in their culture, language and heritage. 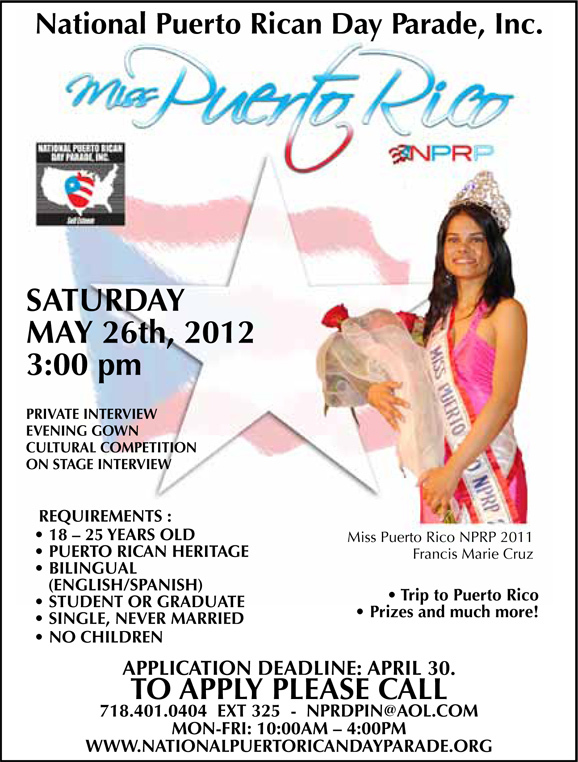 Miss Puerto Rico NPRP will serve as a role model and representative to the Puerto Rican community. The Committee emphasized to all those young ladies who may be interested in the Cultural Pageant competition, as contestants, that they must comply with the rules and regulations of the Pageant. 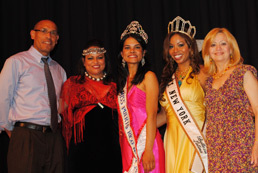 For the Miss Puerto Rico NPRP and her Court, there will be many surprises & prizes. On Sunday, June 10th 2012, along Fifth Avenue, theMiss Puerto Rico NPRP 201 and her Court will ride aboard her own majestic float.